Katahdin is seen from an outlook on the Katahdin Loop Road on Aug. 9, in the Katahdin Woods and Waters National Monument. A Canadian mineral exploration company plans to buy and mine property in northern Maine near the new national monument. Wolfden Resources Corporation of Thunder Bay, Ontario, signed a purchase and sales agreement dated Sept. 6 with a third party to pay $8.5 million for all of the property in Pickett Mountain in northern Penobscot County. Donald Hoy, president and CEO of Wolfden Resources, told the Bangor Daily News that some “fundamental issues” about the purchase need to be worked out before he could comment further about the proposed mining operation and how the company is financing it. The area has a large amount of undeveloped and potentially valuable sulfide minerals such as copper, silver and zinc, Wolfden said in a written statement. 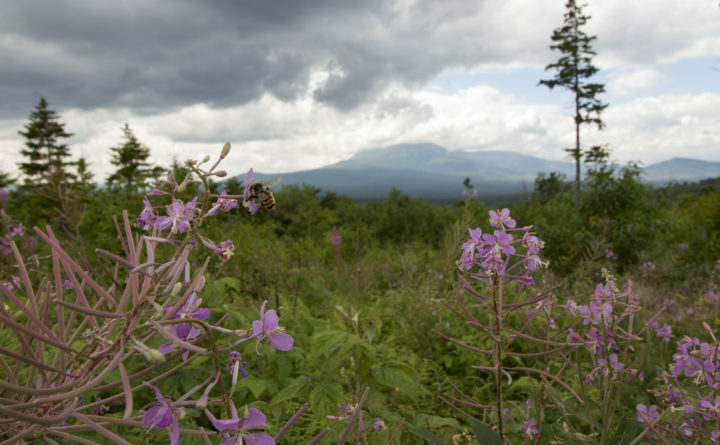 Environmentalists have expressed concern about development around pristine areas like the Katahdin Woods and Waters National Monument and Baxter State Park, but the man behind the new monument said having such industrial activity was in his plan. “I am glad that they [Wolfden] don’t feel threatened by the monument,” Lucas St. Clair said Monday. St. Clair, whose family donated the monument to the federal government in 2016, said he found some vindication in the mining company’s plans. During the campaigns to create a national park and monument, he had argued that the monument could co-exist well with other industries. Maine, he said, has “the strongest mining rules in the country.” His organization, the Friends of Katahdin Woods and Waters National Monument, will monitor any mining that should occur in the area to ensure that those laws are enforced, he said. This will be the first project under the Maine Legislature’s new laws allowing large scale mining of metallic minerals in Maine under certain conditions.